These aren't the inferior "garage-style" units you've seen before, with separate battery-packs and messy wires going everywhere! These are the most powerful, most trouble-free, clear-sounding systems you'll find. And you won't find "toy" batteries in our units either. we feature the finest quality construction and cellular-type battery power systems integrated into our units. And there's much, much more. Be able to warn the riders behind you of that huge pothole, or when you need to make an emergency stop at the next exit. The HJC-90 ensures that you're all on the same page. You'll experience crystal-clear reception, ease-of-use, state-of-the-art voice activated technology, and incredible power making all of your trips more safe and fun! It installs without damaging your helmet and can be removed in seconds. 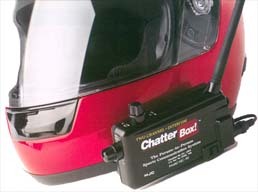 With the HJC-90 you'll recieve everything you need to join the scores of ChatterBox users. 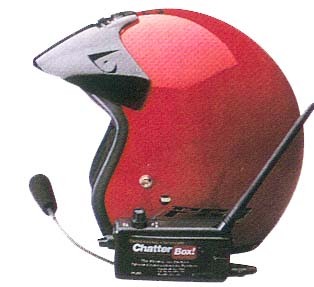 You'll get: the ChatterBox HJC-90 unit with volume adjustment, voice sensitivity control, two channel plus intercom switch, audio in-jack for Walkman® type stereo hookup, puch-to-talk kit; all necessary mounting hardware; microphone with windsock; powerful removable antenna; high-quality foam covered in-helmet speaker system and more.